Patent settlements typically come at times when nobody predicts them rather than as a result of court-ordered mediation. "Barnes & Noble and Microsoft have settled their patent litigation, and moving forward, Barnes & Noble and Newco will have a royalty-bearing license under Microsoft's patents for its NOOK eReader and Tablet products. This paves the way for both companies to collaborate and reach a broader set of customers." The term "royalty-bearing" is a real blow to Google, which tells Android device makers to refuse to pay but doesn't do what it takes to properly address Android's intellectual property infringement issues. The fact that Barnes & Noble partners with Microsoft proves, if anyone still needed any proof, that its mostly antitrust-related "patent misuse" allegations against Microsoft, which the ITC threw out even ahead of trial and refused to reconsider, were bogus claims borne out of desperation (for lack of patents that could be used to bring counterclaims). Barnes & Noble may have had very bad advice from certain lawyers who self-servingly raised totally false hopes in Barnes & Noble's management as to what they could achieve by shouting "antitrust! antitrust!" Look at it this way: if you really thought someone was an anticompetitive abuser of patents, would you form a joint venture with him? There you have it. An important effect of this settlement is that Motorola Mobility is now the only Android device maker to be embroiled in litigation with Microsoft. Just four days ago, Microsoft announced yet another Android- and Chrome-related patent license agreement (with Pegatron, a major Taiwanese company that manufactures devices for others). More than three months ago Microsoft already said that more than 70% of Android devices sold in the U.S. market have a license to Microsoft's patents reading on Android. Those device makers notably include Samsung, HTC and LG -- companies that defend themselves in court against patents all the time if they think there's a point in doing so in a given context. Motorola's strategy is different. Motorola hopes to gain leverage, not only but primarily from abusive assertions of standard-essential patents, in federal court, at the ITC and in Germany, where a decision is scheduled to come down on Wednesday morning (May 2). That conduct has already triggered two EU antitrust investigations and has led a federal judge in the Western District of Washington to enter a temporary restraining order. But it's quite possible that Motorola, too, would have settled the dispute with Microsoft a while ago if Google had not offered to buy the company -- a transaction that hasn't been closed yet. At any rate, the good news is that there's one Android-related dispute less as a result of the agreement Microsoft and Barnes & Noble just announced. Late on Sunday, Judge Alsup filed the final jury instructions and special verdict form (all of this limited to the current trial phase, which is focused on copyright). He adopted various proposals from both parties, but neither party will be completely satisfied with it. Depending on which party wins the verdict, we'll almost certainly see an appeal unless there's a settlement. Google has already filed some objections and I will comment later when I see both parties' objections. In other Sunday news, the parties made various filings with respect to their motions for judgment as a matter of law. I will address those at a later stage as well, with one exception (copyrightability instruction) that I'll talk about further below. The jury will primarily have to decide on infringement and, if any infringement is found in any given area, the fair use defense. It won't get to decide on copyrightability (the parties agreed a while ago that this is a legal, not factual, question), and it won't render a complete verdict on Google's equitable defenses, though the form contains a couple of questions that the judge wants the jury to answer with a view to his analysis of those equitable defenses. "For purposes of your deliberations, I instruct that the copyrights in question do cover the structure, sequence and organization of the compilable code." Google's first objection relates to this. Google says the jury should be told the opposite. Google can't claim prejudice because either the instruction is right or Google is right. If the instruction is right, Google isn't prejudiced (if anyone is prejudiced in that case, it's Oracle because the statement would be even clearer otherwise). If Google is right, it wins the case regardless of the jury verdict. I believe the final instruction on copyrightability is considerably more favorable to Oracle than the "must assume" version, though there may very well be people who are more impressed by being told they "must assume" something. The instructions provide at least a hint as to where the judge stands on the key issues. I have already expressed my belief that the judge wouldn't even be holding this jury trial if Oracle didn't have a reasonably good chance of prevailing on copyrightability. I have read the decisions on which the parties base their arguments and those are clearly in Oracle's favor, especially the Ninth Circuit decision in Johnson Controls v. Phoenix Control Systems. "While individual names are not protectable on a standalone basis, names must necessarily be used as part of the structure, sequence, and organization and are to that extent protectable by copyright." This is actually just consistent with what the judge wrote in an order denying a Google motion for summary judgment on Oracle's copyright claims last summer. That sentence is so very important because it's really the names (a massive number of them, in fact) that the jury can easily identify when looking for virtually identical or substantially similar elements. The structure, sequence and organization would also be identifiable, but that's a much more abstract concept if one has to assume at the same time that the names themselves are not protected. "The amount and substantiality of the portion used in relation to the copyrighted work as a whole. The greater the quantity and quality of the work taken, the less that fair use applies[.]" If the judge hadn't adopted Oracle's proposed insertion regarding the copyrightability of the names as part of the structure, sequence and organization, Google would have had a better chance (relatively speaking) of the jury considering the extent of the infringement to be limited. Now, the use of such a massive number of names that are protected as part of a larger structure will very likely lead the jury to consider the infringement to be quite substantial, which in turn weights against a finding of fair use. In another slight departure from my plan to talk about the parties' objections to the final form later, I'd like to mention that Google is very unhappy that the judge didn't allow the open-ended definition of fair use that Google proposed. Google wanted the judge to tell the jury that it can consider any factor it wants in connection with fair use. Oracle objected, and even before Oracle made its related filing, I wrote that "I would be surprised if the court granted this request" -- and indeed, the court rejected it. Today is an important day: the parties will make their copyright-related closing arguments. I will definitely write about this case again shortly. For now I wanted to highlight what I thought was the most important aspect of the final jury instructions. Apple and Google routinely have discovery disputes. Apple's second California action against Samsung, which includes a motion for a preliminary injunction against the Galaxy Nexus, is already the eighth U.S. lawsuit in which Apple subpoeaned Google, and it's no surprise that Apple would like to receive more information than Google is willing to provide. Typically, the court will resolve such a dispute by narrowing the discovery requests. But what's particularly interesting this time (even if not completely new) is that Google puts its attitude toward "open source" on display. One of Apple's requests that Google opposes is a demand for documents and testimony regarding "[t]he differences, if any", between the code actually used on the Galaxy Nexus and "the Android 4.0 Ice Cream Sandwich code publicly available from https://android.googlesource.com/platform/manifest, or through the process described at http://source.android.com/source/downloading.html". Google's first objection is that it "has already agreed to produce source code underlying" the Android software running on the Galaxy Nexus. Google disputes the relevance of of the open-source code because it "is not loaded on Samsung's Galaxy Nexus device and cannot be relevant to Apple's infringement claims against Samsung generally or the Galaxy Nexus in particular". "Although Google releases some versions of Android through the Android Open Source Project, the internal functionality of Android running on the Samsung Galaxy Nexus is Google's trade secret." Google suspects that Apple made this request "for one purpose only – to design claims for other litigation". Whether or not that is Apple's motive is a separate issue. Someone who claims to be "open" can't have his cake and eat it. Of course, being open means that, potentially, someone will look at code to identify patent and copyright infringements. But under open-source rules the one who wants to do so has the same right to inspect the code as someone who wants to fix a bug (possibly a critical security vulnerability), add a feature, or translate the thing to the Klingon language. Open source rules don't discriminate against anyone who wants to look at the source code. "Because the iPhone source code is a trade secret, plaintiffs have the burden to establish that it is both relevant and necessary." "Exclusion of Motorola's handsets and tablets would also threaten Android, the only freely adaptable, open-source mobile platform developed and distributed in the U.S. Android's open, generative platform will facilitate the next round of innovations in mobile computing and fuel the U.S. technology sector [...]"
"Unlike Apple's much less flexible iOS, generative platforms such as Android encourage innovation, promote self-expression, and protect individual freedom, providing consumers and industry with substantial value." It would be nice if Google could either come clean and admit that it's not really open or (ideally) honor its open-source promise. But if Google buys Motorola, I'm afraid we'll see more "trade secret" claims than ever. All in all, the parties have filed approximately 50 lawsuits against each other, but that's just the number of initial filings. After an initial filing, lawsuits can be consolidated (which effectively happened to the first two lawsuits the parties filed against each other in California) or, which happened far more frequently, split up into multiple lawsuits by the courts. For example, German courts usually look at only one patent per litigation, and sometimes assign more than one case number per patent if there's a delay with serving the complaint on one of two or more defendants. Also, these parties tend to appeal each and every decision, and the list below doesn't contain cases before appeals courts. Furthermore, I'm sure that thre are more nullity actions before the German Federal Patent Court than the ones on the list I obtained (Samsung definitely brought several such actions). Counting all of those additional cases not listed below, the number of cases between the parties is far above 50 -- it might even be closer to 100. Furthermore, the European Commission is formally investigating Samsung's enforcement of patents essential to wireless industry standards against Apple (case no. COMP/C-3/39.939 – Enforcement of standard essential patents in the mobile telephony sector within the meaning of Article 11(6) of Council Regulation No 1/2003 and Article 2(1) of Regulation No 773/2004; formally launched on 01/30/12). Let me remind you: this list is not exhaustive. But as far as I can see, it's the most comprehensive one of its kind to have been published. On April 17, I already reported on the fact that Apple and Samsung agreed, under soft pressure from Judge Lucy Koh of the United States District Court for the Northern District of California, to meet for court-moderated settlement talks at the level of the CEOs and their chief lawyers. Judge Koh wanted the parties to meet within 90 days. The judge who will oversee this settlement effort, Magistrate Judge Joseph C. Spero, has now scheduled this settlement conference for May 21-22, 2012, starting on each day at 9:30 AM. The meetings will take place in a San Francisco courthouse, while the litigation itself is before the San Jose division of the court. With Oracle v. Google, it was just the opposite: the case is currently being tried in San Francisco, but court-ordered settlement talks took place in San Jose. It makes sense to have parties discuss settlement in front of a judge who is not personally involved with the lawsuit. For example, one of the things Magistrate Judge Spero wants the parties to do is to provide a settlement statement until May 9 including, among other things, "a candid evaluation of the parties' likelihood of prevailing on the claims and defenses" [emphasis NOT mine]. I think this is wishful thinking because the parties won't really say that any of their claims are legally weak, no matter in front of whom these talks take place, but there's no way they would ever express even the slightest skepticism over any of their claims in front of a judge involved with the actual litigation. These parties have disputes pending in ten countries. For a long time I said that they were suing each other in nine countries and also had a purely defensive Samsung action (against several Apple design-related rights) pending in Spain -- but in a recent filng I saw that on February 27, 2012, Apple sued Samsung in the Community Designs Court of the European Union in Alicante, Spain, for infringement, apparently seeking a decision of Europe-wide effect with respect to its design-related rights. The Alicante court has the authority to impose a Europe-wide ban on products infringing Community designs (EU-wide design rights) even on a Korean company like Samsung Electronics Ltd. (and not only on its local subsidiaries) regardless of whether or not the worldwide parent company of the Samsung Electronics group is considered to have "establishments" in a given European country, an issue that was disputed between the parties in Düsseldorf, Germany. Anyway, with Apple's infringement action in Spain, it's a fact that offensive lawsuits between the two players are now pending in ten countries, but by another count, the number is actually -- don't be shocked -- 31. Here's why: Apple's lawsuit in Alicante will relate to the entire European Union, which currently has 27 member states. Previously, there were infringement lawsuits in five of those countries (Germany, UK, France, Italy, Netherlands) and in four non-EU countries (United States, Japan, South Korea, Australia). 27 EU member states + 4 non-EU-member-states = 31. The next post will list more than 50 lawsuits the parties have filed against each other in little more than a year. With all that's going on, it's hard to stay on top of all smartphone-related patent lawsuits. I'm doing my best but today I found out about six new patent assertions by Apple against Motorola and HTC that were discoverable, and weren't actually discovered by anyone else who would have written about them, since March 12. In the Southern District of Florida, Apple responded to a Motorola complaint fild in January 2012, targeting new products and services (the iPhone 4S and the iCloud) over six patents previously asserted against older Apple technologies. Motorola originally wanted to bring those infringement allegations in a Miami litigation involving those same patents that has been going on since October 2010, but the judge presiding over the case at the time didn't allow this. Meanwhile a new judge has taken over and vacated that denial, and wants to explore the possibility of consolidating this cases. But at the time Apple had to respond to Motorola's new Florida lawsuit, that possibility wasn't on the horizon. Apple decided to pay back in kind by asserting its own patents from the first Florida case against some newer Motorola products and to go for further escalation by adding six patents not previously asserted against Motorola. And Apple decided to simultaneously assert them against HTC as well, for the sake of sweeping but efficient litigation. As a result, the claims and counterclaims in that lawsuit are asymmetrical: in addition to Apple and Motorola asserting against each other old patents targeting new products, there are six new patents in play against which HTC has to defend itself in the same case. This is the first time for Apple to bring claims against two independent Android device makers in the same lawsuit. By bringing counterclaims, Apple ensured that Motorola wouldn't be able to quickly extend a potential infringement finding against older Apple products in the first Miami case. Its counterclaims definitely slow down that second Miami action and ensure that whenever Motorola may win any favorable ruling there, Apple also has a chance of winning something. The six new patents are quite young. The "oldest" one was granted in December 2010, while the other five patents were granted between September 2011 and January 2012. It's a clear message to the Android camp that Apple's patent portfolio is getting stronger by the day. U.S. Patent No. 8,046,721 on "unlocking a device by performing gestures on an unlock image"
This is the new slide-to-unlock patent Apple is also asserting against Samsung in its second California lawsuit (and in the motion for a preliminary injunction it brought there). This one will go to trial against Samsung in Northern California in the summer. Apple won some favorable claim construction there. U.S. Patent No. 8,014,760 on "missed telephone call management for a portable multifunction device"
This is one of the patents at issue in Apple's second California lawsuit against Samsung (but it's not being asserted in the related motion for a preliminary injunction). U.S. Patent No. 8,031,050 on a "system and method for situational location relevant invocable speed reference"
This one hasn't previously been asserted anywhere. U.S. Patent No. 8,074,172 on a "method, system, and graphical user interface for providing word recommendations"
This is one of the four patents used in Apple's second California lawsuit including the related motion for a preliminary injunction. U.S. Patent No. 8,099,332 on a "user interface for application management for a mobile device"
This one hasn't previously been asserted anywhere. Granted in January 17, 2012, it's the youngest Apple patent to have been asserted to date. But if the smartphone patent wars continue, we'll definitely see even newer ones at some point. The next important step in Miami will be a decision on how to organize those two cases. It would probably make sense for the court to consolidate the parts that assert old patents against new products. But in that case, the parts remaining in the second Florida action would just be a six-patent Apple lawsuit against Motorola and HTC. Apple's disputes with those parties have different centers of gravity (Illinois and Delaware). I'm sure Apple would want to stay out of Delaware, where a district court stayed all of Apple's pending claims against HTC in a decision that was unusual and unfair to Apple. I guess Apple would rather litigate over those patents in the Southern District of Florida, which is reasonably fast by U.S. standards (though it would be slow by German standards), or alternatively go to the Northern District of California (a district to which HTC once wanted to move its litigation with Apple, a transfer that would have been much better for Apple than staying in Delaware). Illinois is rather unlikely because Judge Posner will take the Apple v. Motorola case pending there to trial in June, so it would be too late for a case transferred out of Florida to have any synergy effects with litigation pending in Chicago. On Thursday afternoon, Judge William Alsup filed his "proposed charge to the jury": draft jury instructions and a draft special verdict form for the current, copyright-focused, trial phase. This (Friday) afternoon, he will discuss these documents with the parties' lawyers, who already identified their priority issues in filings made at around midnight local time. Since it's possible that this material still undergoes significant change (even though the judge "believes [it] adequately and fairly covers all issues actually still in play"), it's too early to discuss it in detail. I'll just focus on the items the parties addressed before and after the judge presented his proposal. "It is my job to decide whether or not the copyrights on the computer programs do or do not extend to protect the structure, sequence and organization of the code of the programs. I will not be able to decide this question until after your verdict. For purposes of your deliberations, you must assume that the copyrights do cover the structure, sequence and organization of the code." He was previously inclined to simply say that the structure, sequence and organization of the API packages is copyrightable. Google objected strongly because this would lead the jury to think that Google lost on a key point. This means Google avoided a representation of the legal situation that it didn't like. At the same time, "must assume" is probably the most that the judge could do short of saying that copyrightability is a given. Oracle's midnight filing doesn't address this matter at all. Nor did Oracle reply in any separate pleading to Google's argument about the assumption of copyrightability. I don't know if Oracle will still raise this issue, such as at the hearing this afternoon, but at least for now it appears that Oracle can live with "must assume". Google wants the definitio nof "work as a whole" to be as broad as possible. It made a filing dedicated to this issue even before the proposed jury instructions were presented, and two of the three priority items of its critique of the judge's proposal relate to this matter. Google complains that "[a]cross the three questions that involve the “work as a whole” concept, the Court asks the jury to apply four different works as a whole". It wants the entire J2SE platform to be the work as a whole "for all purposes" (substantial similarity, fair use, and de minimis). While Google's interest in this is understandable (the broader the work as a whole is defined, the easier it is to argue that Android's APIs are different or that Google's use of such material was allowed), at least one of its arguments doesn't make sense: "Oracle claims that it does not allow subsetting of the API libraries" -- that's simply a rule to ensure full compatibility and doesn't mean that subsets can't be relevant in an infringement context. As far as the copyrighted original material is concerned, Oracle insists that "[t]he structure, sequence, and organization ('SSO') of the API packages exists within the API documentation as well and Google should be liable for copying it", arguing that "[r]egardless of whether the SSO is expressed in the compilable code or the API documentation, it is protectable expression in both cases". Furthermore, Oracle reminds the judge of his holding, at the time he threw out Google's motion for summary judgment against Oracle's copyright claims, that there's a "possibility that the selection or arrangement of those names [which are uncopyrightable on their own] is subject to copyright protection". That doesn't mean Oracle could sue anyone for using a simple word like "print", but without Oracle's requested clarification, the concept of structure, sequence and organization would be too abstract -- and it's a fact that elements that are non-copyrightable on their own can form part of a larger copyrightable work (in a way, every copyrightable work consists of non-copyrightable elements). Either party requested additional instructions with respect to Google's fair use defense. While Oracle wants those instructions "supplemented", Google objects rather strongly to the current proposal. Google wants an open-ended definition of fair use, asking the court to insert this sentence: "You may consider whatever additional factors you believe are appropriate, on the facts of this case, to assist in your determination of whether Google's use is a fair use." While the case law on fair use is reasonably inclusive, it's not open-ended. I would be surprised if the court granted this request. Another Google proposal is much more reasonable: "All of the fair use factors must be weighed together. No single factor compels a conclusion of fair use or no fair use." This particular wording may not be adopted, but something along those lines might be. Google wants the assessment of "the purpose and character of the use" to include "whether such work is transformative (meaning that it adds something new, with a further purpose or different character, altering the original with new expression, meaning, or message)". A criterion like "adds something new" is a very low hurdle. Regarding the assessment of the nature of the copyrighted work, Google wants to place some emphasis on "whether the work is fictional or mostly functional or factual". Obviously computer programs are more functional or factual than a novel or a song -- nevertheless they are copyrightable. "[F]air use of a copyrighted work . . . for purposes such as criticism, comment, news reporting, teaching (including multiple copies for classroom use), scholarship, or research, is not an infringement of copyright." I think this is useful context for the question of what kinds of use are fair use, even though some of this typically isn't relevant to computer programs. "Commercial use weighs against a finding of fair use." "If the original copyrighted work is creative in nature, this cuts against a finding of fair use." "The greater the quantity and quality of the work taken, the less that fair use applies. Copying may not be excused merely because it is insubstantial with respect to the infringing work." "When the defendant's use of the copyrighted work competes with the copyrighted work, then it is less likely a fair use"
Three of these four cases involve high-profile parties. Items 1 and 3 are based on a case in which Elvis Presley Enterprises was the plaintiff, and item 2 is a case in which Napster was the defendant. Those requests for clarification may be easier to sell to the court than fundamental changes such as with respect to what the "work as a whole" should be. The ongoing Oracle v. Google trial continues to bring interesting material to light on a daily basis. 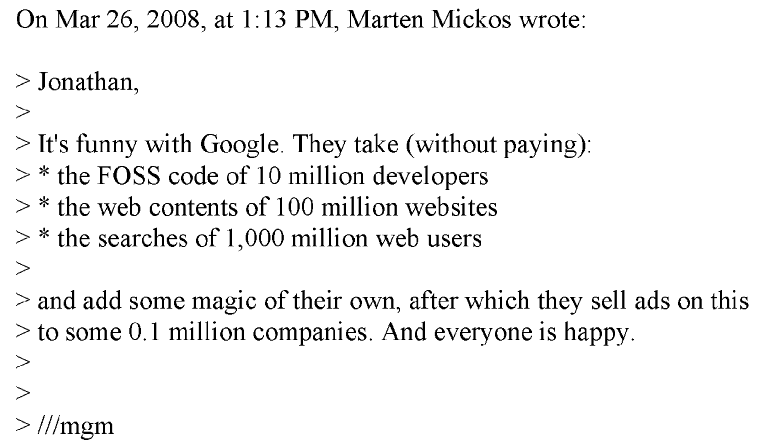 In a single document made public by Oracle yesterday, which contains Sun-internal communication about Google in connection with Android and Java, I found several interesting statements on Google's attitude toward copyright and licenses. "The Google thing is really a pain. They are immune to copyright laws, good citizenship, they don[']t share. They don[']t even call back." In yesterday's testimony, Jonathan Schwartz tried to do as much damage to Oracle's case as he could. But that doesn't mean he always felt good about what Google was and is doing. 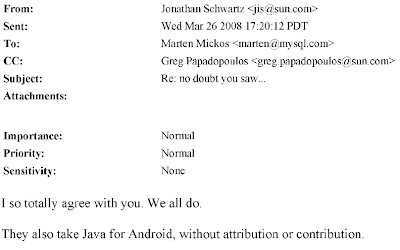 On March 26, 2008, in correspondence with former MySQL CEO Marten Mickos (who after Sun's $1 billion acquisition of MySQL served as senior vice president of Sun), Schwartz wrote to Mickos, in the context of Google's business strategy of taking without paying, that Google also "take[s] Java for Android, without attribution or contribution." ...was with my Google buddy over the weekend, and we got to talking abuot licenses. He made some pretty interesting comments about their internal (as communicated by senior mgrs) view of licenses. They hate GPL, they like Apache, and they love BSD. Concerning the last part, in recent years I haven't heard anything derogatory from Microsoft about the GPL. The official position appears to be that they "disagree" with it. Anyway, this here is about Google, not Microsoft. The GPL has a contribute-back mechanism that Google seeks to avoid. That's why it doesn't use the Java code that Oracle/Sun made available under the GPL. Unlike the GPL, the Apache license allows software published under it to be incorporated into proprietary (closed-source) software. And the BSD family of licenses are tantamount to an author of a program saying, "I hereby dedicate this work to the public domain". and add some magic of their own after which they sell ads on this to some 0.1 million companies. And everyone is happy." I actually have a somewhat more favorable view. I don't see Google generally "taking" the content of websites by indexing it and generating traffic, except in some cases in which content (such as from vertical search portals) gets integrated into the search engine in a way that Google strengthens its own services at the expense of other companies' websites. I also do respect, to be clear on this, what Google itself does in terms of developing great technologies of its own. I really like many of their services (this blog is hosted by Google's Blogger service), and Android. At the same time, there are intellectual property and antitrust and even sometimes data privacy issues, and I call them out on some of that. "I so totally agree with you. We all do. They also take Java for Android, without attribution or contribution." how the heck is Java going to be part of the Apache distro that the Android software is being given away under? Is this a legal issue between you and Google? How come they are using Java and you aren't part of their Alliance?" God knows. They didn't want us to open source Java - they've already made some stupid comments about the GPL (the license of both Java and Linux - the foundation of what they're building). But they did a great job of hyping Andy Rubin :-)"
That answer shows Schwartz underestimated Android at the time. He's right about what worked for Apple, but what Google did with Android also worked (in terms of appealing to application developers). 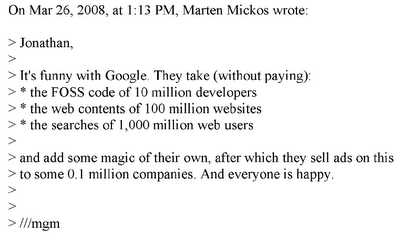 I think Schwartz was being overly diplomatic by referring to Google's approach to free software as naiveté. Scott McNealy's statement that they are "immune to copyright laws, good citizenship" was a more accurate description. In my opinion, a very consistent disregard for other people's and companies' intellectual property rights, whether it's in connection with Linux, some non-Linux GPL software, Java or most of YouTube's content, can't be attributed to naiveté. There comes a point when someone who's always naive when it benefits him is simply being reckless and possibly arrogant. 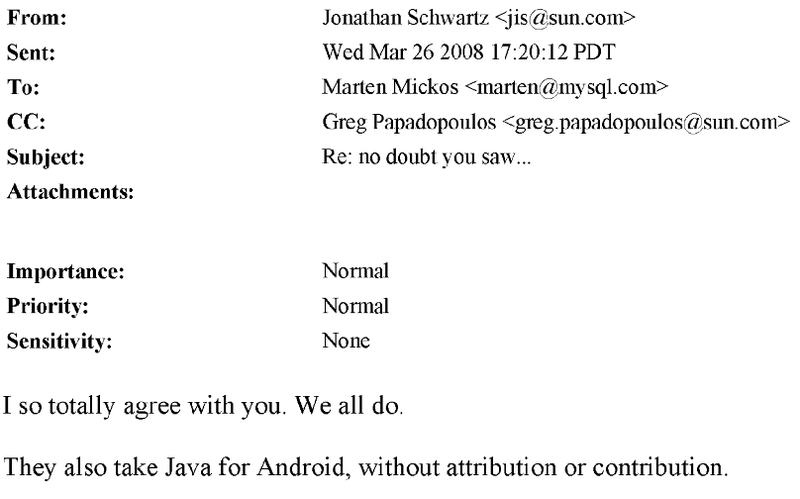 Anyway, those emails probably helped Oracle to demonstrate to the jury that Schwartz didn't genuinely believe Google had the right to make use of certain Java-related intellectual property the way it did and continues to do.